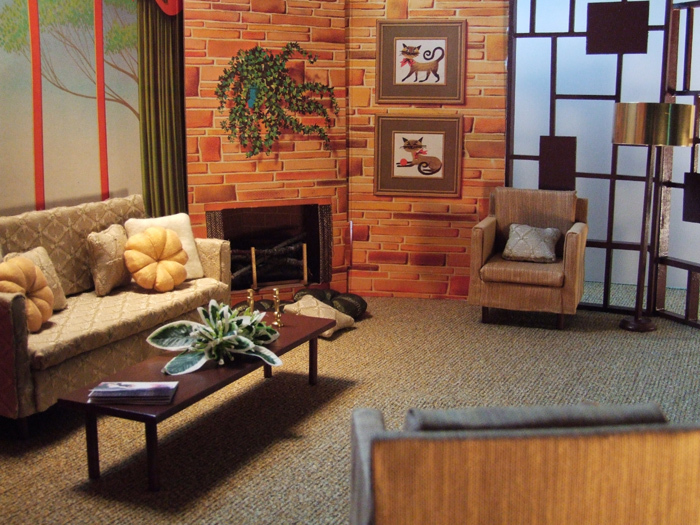 This was my first chance to design for an entire house (albeit miniature)! 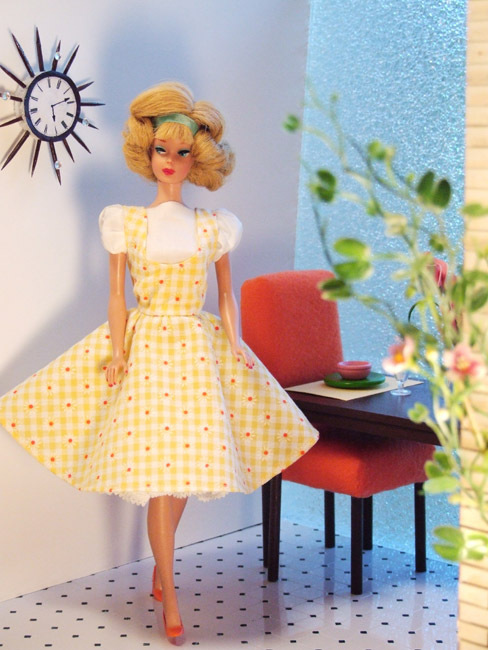 Pat Henry asked me to redesign Barbie’s New Dream House for the first virtual Barbie Issue of FDQ! I was so excited ! 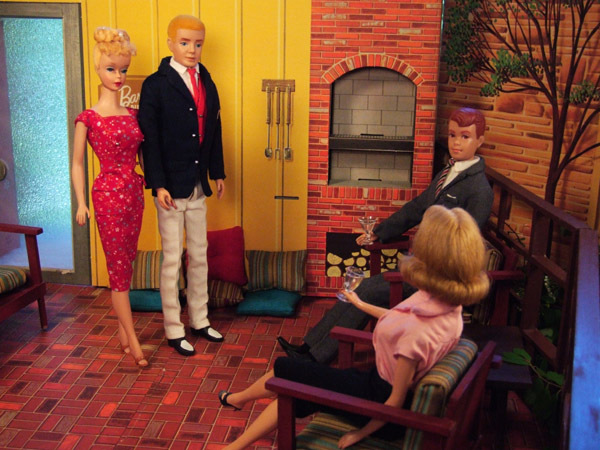 A chance to give Barbie some REAL furniture! Enter the Living Room, where things have been the same for , oh- 45 years. More space was needed, so I added a stylish room divider to open the floor area making more space. This allowed me to put additional furniture in the living room. Here’s a view looking into the room from the hallway. Cool effect, no? 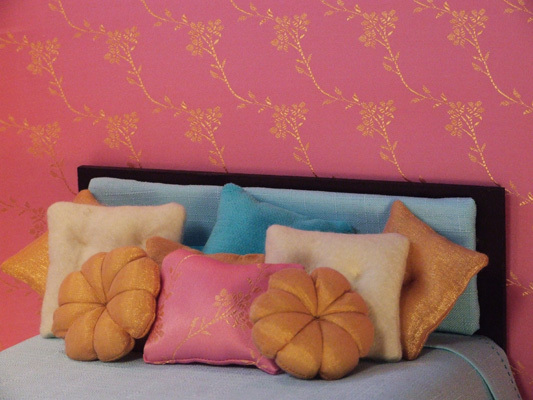 The thing with already existing walls is that you have to incorporate the colors given. In the living room, the colors were green and red. Gold was a very popular color choice in the 1960’s, so that was the palette I decided on for the upholstery. 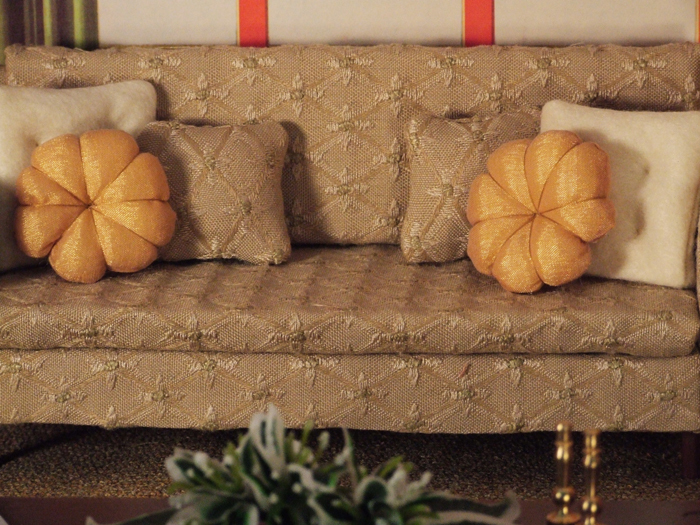 In this close up of the sofa, you can see that the fabric also has little flecks of green in it, which blends nicely with the surroundings. 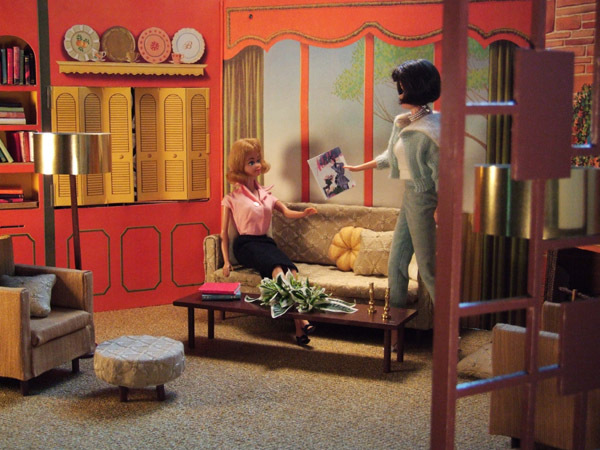 Oh Gosh – Here’s Barbie and Midge enjoying the newly styled living room. Midge is hoping she can get some ideas for her own place! Kitchen Nightmares! – I did not know WHAT I was going to do with this kitchen at first. I mean, who decorates their kitchen in orange and pink?! Oh yeah – Barbie ! This tiny galley kitchen needed room for a table. 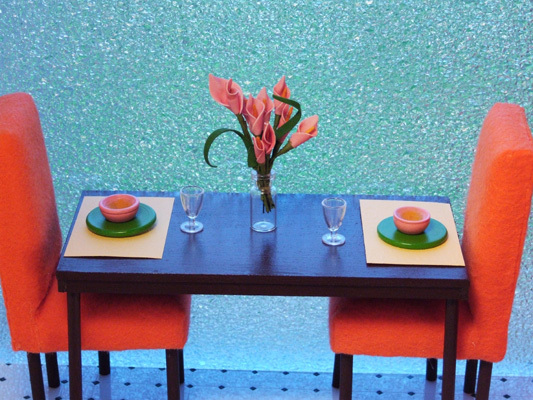 I used a “cracked glass” backdrop to imply a large window giving ample room for a place to sit. One of the neatest features of the NDH, is the open and close shutters between the living area and kitchen. Here’s a colorful shot of that feature. As you can see, I was able to incorporate the orange/pink color combination into the kitchen. It really did turn out cute. In this photo the natural light coming through the window casts a pale blue hue making a the perfect backdrop for this shot! On to the Bedroom. Everyone knows a lady needs privacy! Notice in the above photo that there is now a wall between the kitchen and the bedroom area. This provided the perfect place to set a new bed for Barbie! 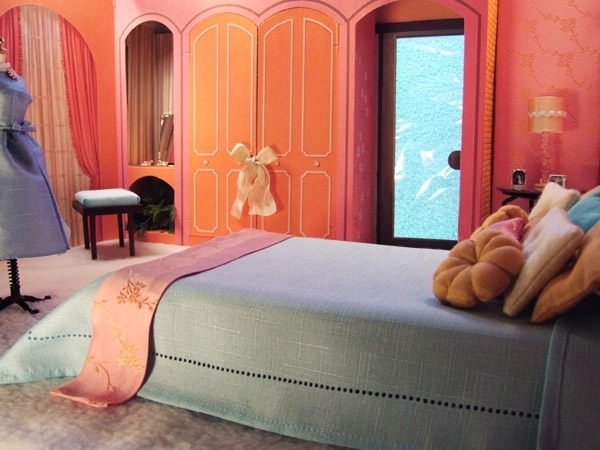 The bed, redesigned for Barbie, is now a full size. Complete with upholstered headboard, matching bedspread and oodles of colorful pillows for a luxurious nights’ sleep! A lady always likes to look her best! 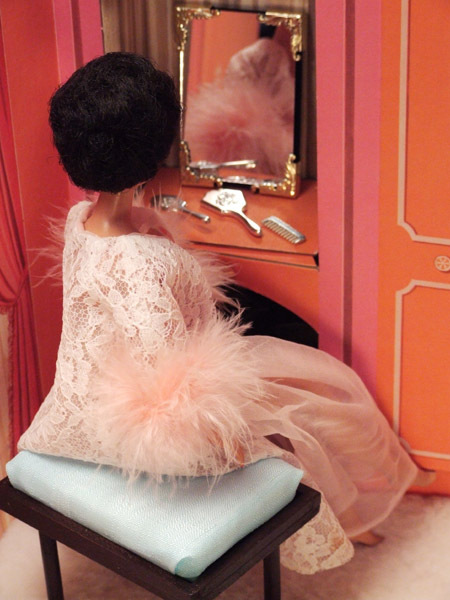 Here’s Barbie enjoying her newly styled vanity with framed glass mirror and upholstered vanity seat. 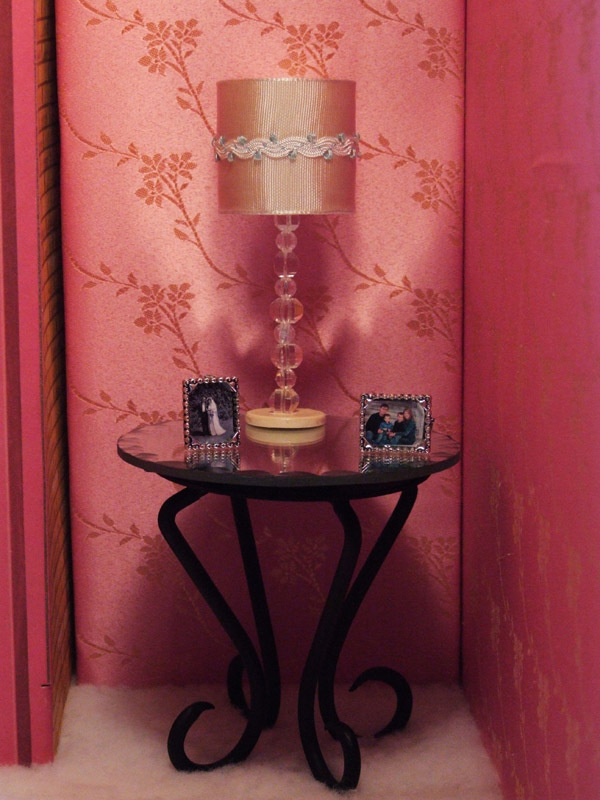 A small niche provides a perfect place for a bedside table which houses a lamp and personal effects like family photos. Next – The Great Outdoors! 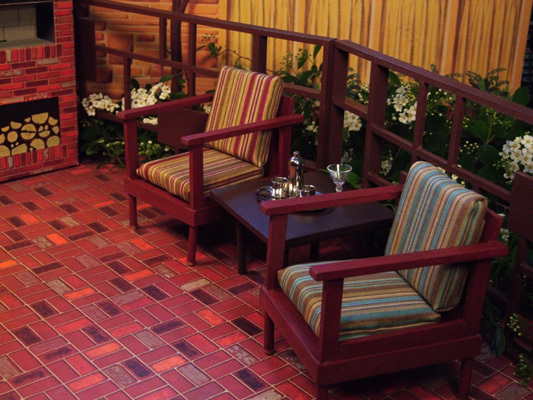 The NDH also provided a back yard patio. This space was revamped as well. 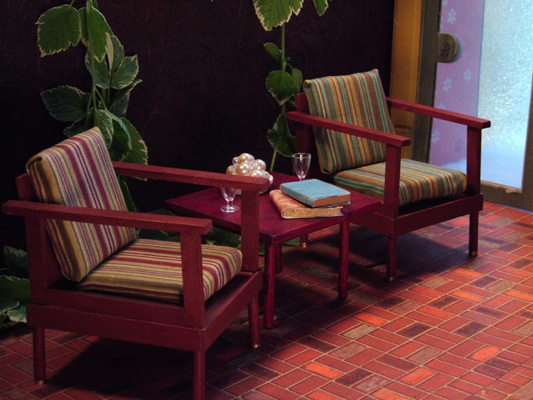 Comfortable patio furniture greets you as you enter the space from the sliding glass doors. To the right, a small garden features wild flowers. These are actually REAL flowers that grow outside my house in the spring! Don’t they add life to the space?! And, last, but not least: Here’s the FAB FOUR enjoying some quality time together, as they lift their glasses to Barbie’s New Dream Home ! I hope you’ve enjoyed the tour. I’ve been wanting to share these photos for a while. This seemed like the perfect venue to do so. I love it! I am so glad you posted this! I missed it the first time and it is wonderful. I love looking at your creations! You are very inspiring. 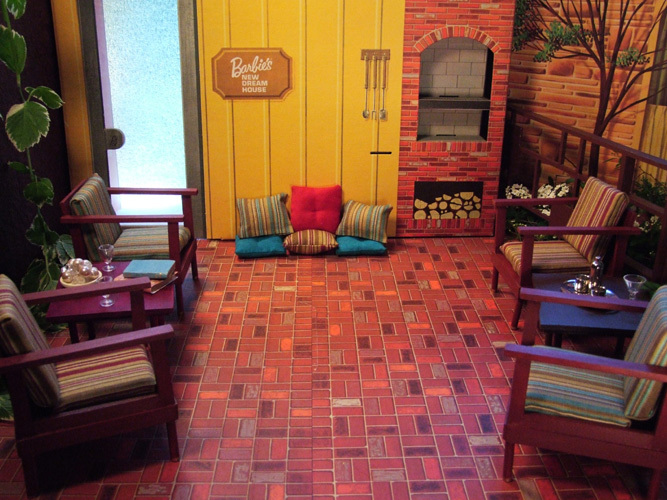 I was so tired of the pink plastic furniture for my doll house. Now you have given Barbie and I what we want. We both can be happy with a stylish home setting. Also, I’m so excited because I just found a local Barbie club I’ve joined and I’m having a great time with the girls. Thanks Mary Ann!!!! Oh my gosh! You are amazing! I love what you’ve done for Barbie’s New Dream House. Now, can you shrink me down to 1/6th size so I can go live in it? Maryann, this brought tears to my eyes. I don’t think anyone could have done this more beautiful than you. Just outstanding! 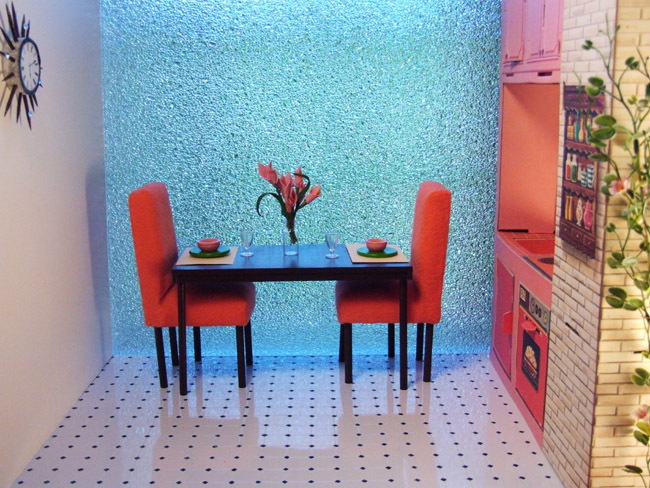 How much fun to see the Barbie’s Dream House recreated by you! What a great job! Wow These rooms are fantastic! HJow long does it take you to complete the rooms once you have all of the pieces? I made all the pieces for each room, so the article did take a while to put together. And, because the NDH is so large, I had to photograph it in sections. Glad you are enjoying it. Oh I love it! Thanks for the tour and memories. WoW!! What workmanship! Maryann your Dream House is fabulous! What a trip back in time! MaryAnn- WOW!!! is all I can say! Love the pillows! You have done a fantastic job! Love it, love it, love it! OH wow! I want the whole thing. Excellent designs. The rooms are wonderful! I can look at your work all day! LOL ! Please do ! So, cool… a childhood dream brought to life :). I love all the little details. Truly awesome!! Wow, I guess you have been busy. You really are amazing and very talented. I love what you did for Barbie. I want to go live with her. Lol!!! This is simply amazing. Thanks so much for posting this. Wonderful! I just love viewing your detailed creations. I am in awe of your ability to visualize what you want to do to a room and then are able to make it happen. 😀 *This* is a space I would want to live in! Thank you for the lovely compliments. 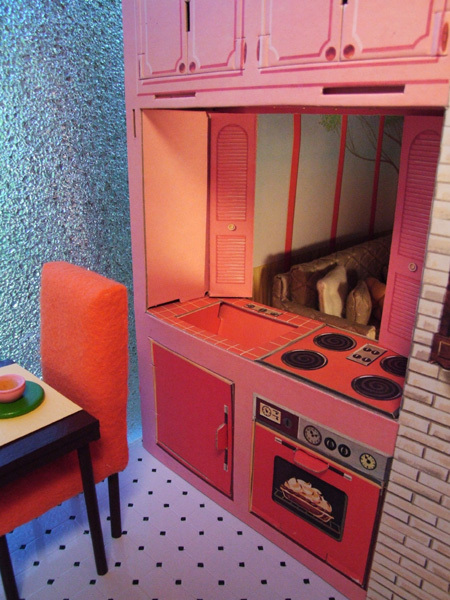 This is indeed the 1965 version of Barbie’s New Dream House. I’m so glad you enjoyed it. I hope you will occassionally visit Welcome Home to see what I am up to. Maryann, I am just in awe. Every time I see your work I am just amazed. Thank you so much for sharing your work and thoughts with us. Hey cousin! just wanted to let you know you know that your work is AMAZING! Love ya! Thanks Sweetie! Hope to see you soon! I am lovin’ these photos and most importantly – getting INSPIRED! Awesome work as always Maryann! WOW, I need to move there. So well put together. That is absolutley amazing! wish I had one like it .. gorgeous you are so clever! I seriously love your work. I have made some furniture for my dolls before when I was younger but my scale is always a bit off. As you say, seeing your work does inspire me along with the pictures I see in old magazines for ideas to make a real doll house for my dolls I’ve been wanting to do that for years. To see this version of a Barbie Dream house in 3d is probably the best idea anybody had come up with and they found the right person to create it! Thank you Meg ! Much appreciated ! This is stunning work! I love everything you do. Gosh, wouldn’t it be nice if the original one, which was all the cardboard (I inherited one.) looked like this!! This is done with such an eye for beauty, detail, and style. WOW! I love the bedroom, dining area, and the little niche. Is this is the one one of its kind? Yup – the one and only. amazing! i love it. and feel inspired. 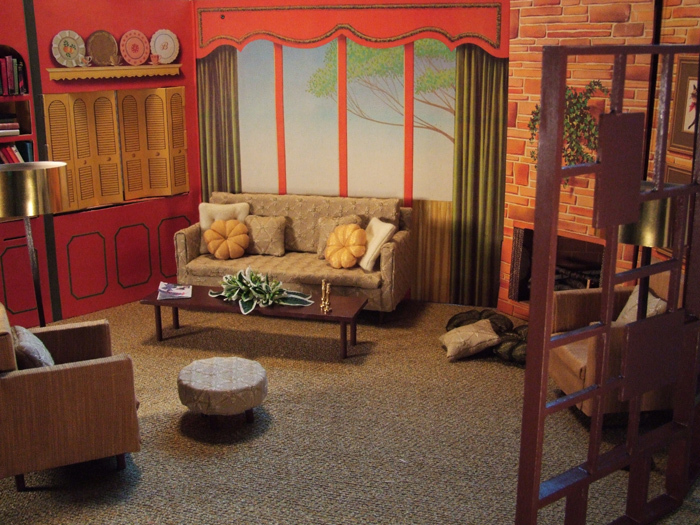 i just bought a cardboard dream house off ebay(the studio college dorm room looking one) and want to either make the furniture (and probably fail) or buy lovely scaled furniture like you so wonderfully design. i adore your photos and work. it’s interesting to see grown women still loving a piece of childhood–and a piece of history. Verry stunning stufffs! Feast for the eyes really!! I like your dream house Are you still adding? Are there pieces for sale also? Thank you. The pieces to this dream house are sold, but I will be re-designing the First Barbie Dream House in the New Year, so stay tuned!